I don’t know about you, but I’m looking for some holiday food gifts to make. They need to be easy to make and delicious to eat. I have a few great recipes to share the next few weeks, so we can get our holiday making done together! The first recipe in this series is from Emily von Euw’s new book, 100 Best Juices, Smoothies and Healthy Snacks. The book would be a great gift all by itself, but you could be super-sweet and make them some of these Green Earth Orbs to go with it. These are similar to what I think of as raw truffles. 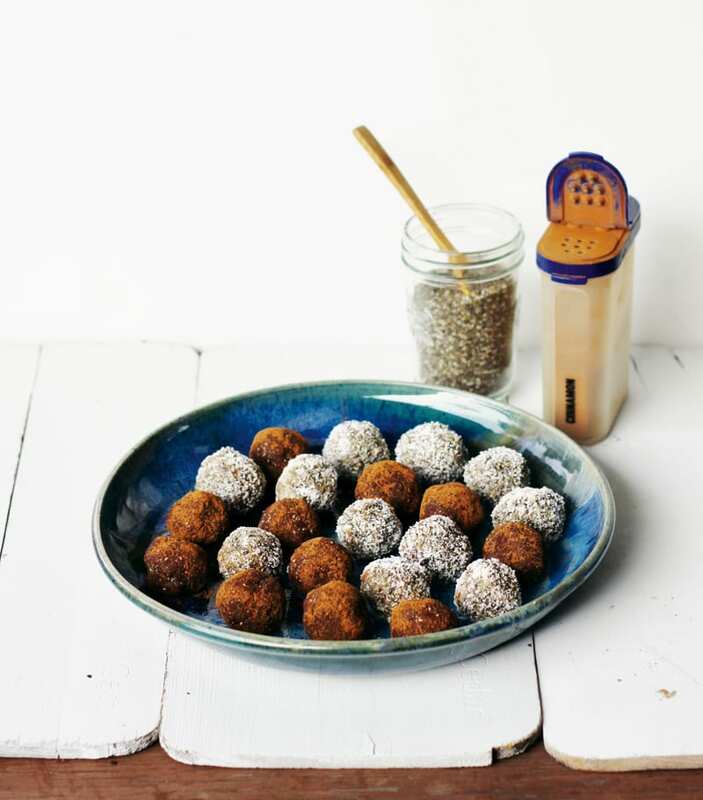 All you need is a food processor and enough time to shape the mixture into balls and then roll into cinnamon and cocoa. Emily’s book is full of sweet juices, savory juices, sweet smoothies, savory smoothies, all kinds of vegan milk and milk shakes, with some energy bars and healthy snacks thrown in for good measure. The photographs are beautiful too. I did receive this book for free, but all the opinions are my own. Pulse the nuts and seeds into powder in a food processor, then add the rest of the ingredients and process until it all begins to stick together. Try rolling a small handful into a ball. If it works, roll the rest of the mixture into balls. If it is still too crumbly, add more coconut oil or dates. 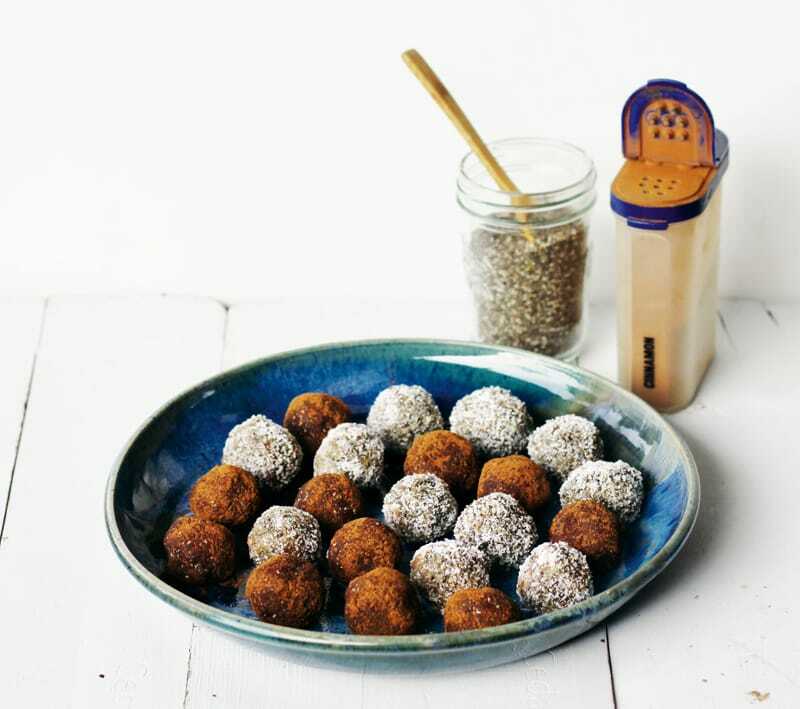 Roll the balls in coconut and cinnamon for extra flavor and nutrition. I have a tree full of guavas (the white ones, not the pink). They are so fragrant, and, well sweet and delicious. I’ve just moved to this new property, so have never had a guava before. Do you have any ideas for recipes? Once they are off the tree, they have about 1-2 days before they are smooshy. There are seeds inside, and they are hard, but when I eat the guava raw and off the tree, I just eat the seed, also. Would love some cool ideas. There are about 3 guavas per day that are ripe.